In the YouTube age, the cut-for-time Saturday Night Live sketch has become a new way for SNL fans/critics to grumble about the venerable late-night comedy institution. And, yes, sometimes a sketch that was written, costumed, scored, and fully produced at the show’s Saturday night dress rehearsal is revealed to have been at least weird and unique enough that its loss to the mists of time and Lorne Michaels’ whim is a real head-scratcher. People rightly talk about Will Ferrell’s Old Prospector sketch (that eventually surfaced on one of his best-of DVDs), but here’s some love for poor, departed, one-season featured guy Luke Null, whose one decent showcase was inexplicably binned, essentially sealing his fate. Well, former SNL head writer, performer, and Weekend Update anchor Seth Meyers has his own late-night show now, along with a whole lot of former SNL colleague pals with axes to grind. Thus, “Second Chance Theater” was born, with Meyers inviting performers whose darlings were unceremoniously killed back in the day to trot out those sketches that they are absolutely certain will be the ones doing the killing, some years later. 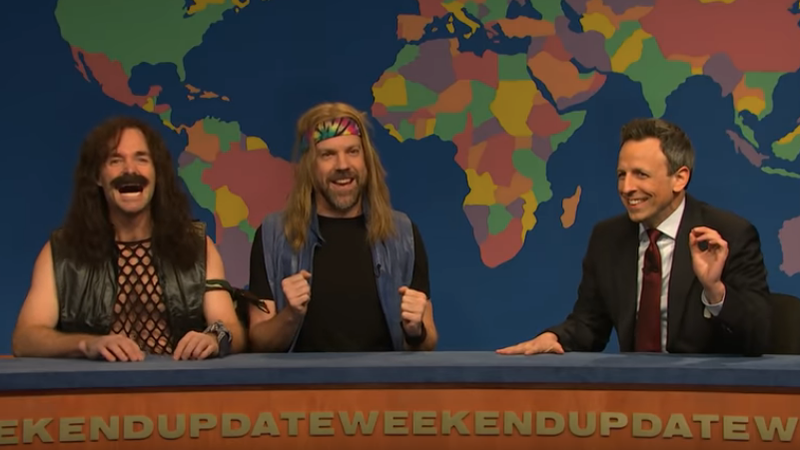 On Wednesday’s show, it was Jason Sudeikis and Will Forte’s turn, as they were given the chance to unveil the Update segment that wasn’t, featuring their never-popular characters, “Bon Jovi opposite band,” Jon Bovi. Pitching their new Christmas album, the enthusiastic rockers regaled Meyers (back behind his very own Update desk) with favorites like “Dying On A Prayer.” See? Because of being a Bon Jovi opposite band. You get it. Does the bit deserve cult rediscovery status? Well, you’ve got plenty of information to contemplate, as Meyers indulged his buddies with long segments both describing the genesis of the sketch (which one-time SNL host Jon Bon Jovi did not care for, for some reason), and an extensive, extended YouTube Q&A afterward, with Sudeikis, Forte, Meyers, and sometime Late Night bandleader Fred Armisen all digging deep into the misunderstood . . . masterpiece?